Jeju United travel to Sangju Sangmu on Saturday evening as they look to record a third win in a row and potentially close the gap on league leaders Jeonbuk. However, despite struggling in the league, Sangju Sangmu will go into the game full of confidence after a big midweek win against the first place team. 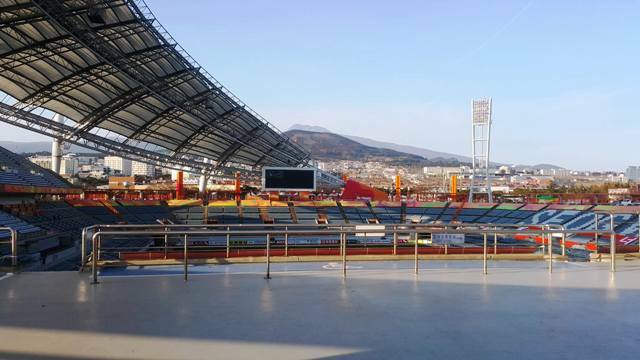 The game will be played at Sangju’s Sangju Civic Stadium and will kick off at 7 p.m. KST. How were their last games? As mentioned above, Sangju’s last game was an impressive win against league leaders Jeonbuk. Despite going one goal down they drew even in the second half before ex Jeju player Kim Ho-nam scored a brilliant goal in the 90th minute to make it 2-1. Jeju’s also won their last game, an important 3-2 away victory over Suwon Bluewings. While this game was noticeable for an 82 meter goal scored by their Australian CB Aleks, it also showed a steely defensive determination from Jeju as they held on in the final minutes of the game. How is their recent form? Jeju United are in an absolutely incredible run of form that has seen them go for ten games without losing a game. This has included wins against top half rivals Ulsan, Suwon, and Gangwon, and a good away draw against FC Seoul. Sangju are on a mini two-game winning streak with a good win over Gwangju coming before their recent win over Jeonbuk. However, prior to this, they lost eight games out of nine in a run that saw them drop down to third from bottom. How have previous games between the two sides this season finished? Jeju have been comprehensive winners in the two games between the sides this season. They beat them 4-1 at home before recording a 3-0 away win in the away leg. Jeju should fully expect to win this game. It is very important that they do so as a win will put them on the same points as Jeonbuk at the top of the league. This could be a major mental boost even if it is only until Jeonbuk play on Sunday. However, Sangju can’t be written off and their last two results against top half teams suggest that Jeju will have to be at their best if they want to get a result.